Yesterday we celebrated my oldest daughter's 9th Birthday! Grandma and Grandpa (my parents) came over from Tampa for the day. Here they are with the kids at Ethos Vegan Kitchen just outside downtown Orlando. Coincidently, we got the number 9 for our order! Here she is with dad as the party continued at Hot Olives in Winter Park after he came home from work...and yes, I love that I only had to cook breakfast today and that was oats! 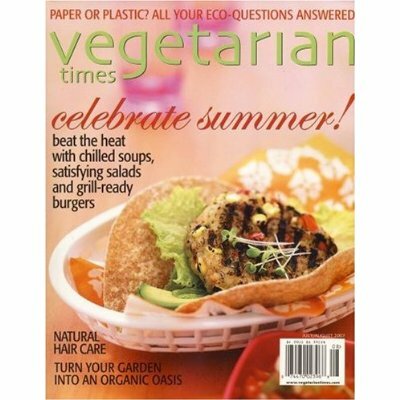 You can get a one year subscription of Vegetarian Times for only $7 right now on Amazon! This magazine is choc full of vegan and vegetarian recipes and features articles on organic and natural living. It also makes a great gift for a friend or family member who is trying to eat healthier. Yesterday I helped make Vegan Sushi with my friend Janelle. When I say help, I mean I brought the Nori (seaweed wrappers), diced the avocado, tofu and carrots, and I cut the rolls into all these beautiful slices :) Janelle and I like to get together and cook vegan food...or run. She had a baby this year so it's been awhile since we ran together, but we're still turning out some great tasting food. When my kids heard that we also had Miso Soup they were all about having Miso Soup (AKA "Seaweed Soup") for dinner tonight. It's been awhile since they've had some and my kids love seaweed, so any excuse to eat seaweed! So at my trip to Whole Foods today I picked up a tub of Miso Master Organic Chickpea Miso. Chickpea Miso contains no soy, it is fermented chickpeas in a paste form. It is super healthy because it is essentially a raw food that contains genistein, which is an isoflavone that protects against breast cancer. So you never want to put the paste in boiling water. You want to add it to the same water temperature as you would tea leaves- the point at which tiny bubbles are beginning to emerge from the bottom of the pan. If you have never bought Miso at the grocery store, always buy it Organic and in a paste form, NOT the little packages of dry powered miso with dehydrated tofu and seaweed. Those are super salty and low quality. I like the Chickpea Miso because it is super mellow and has a naturally sweet flavor that kids love. There are different types of Misos, some have a strong flavor, like Red Miso and Barley Miso. These Misos make a good sauce or dressing or added flavor to a vegetable soup, but you might not want to make Miso Soup straight up from them. The directions on how to make Miso soup are super simple, they are inside the package! I make my Miso with water or no sodium vegetable broth or stock. As you can see, someone is happy I made Miso soup...and she ate three bowls loaded with Wakame and a little bit of organic sprouted tofu. When we add this much Wakame we like to call it "Seaweed Soup"! If you've never bought Wakame before, Eden Organic makes a good one and they come dehydrated so you just add them directly to the water. If you don't like big pieces then you can hydrate the pieces in a separate bowl of water and chop them into small pieces. Give Miso Soup a try at home and tell me about it in the comments section! I am providing links to the recipes on other websites so you can take my meal plan and make a shopping list from it. The location of the Virgin Oil Co is in the heart of Helsinki. It's no wonder the place is always packed full of people, both locals and tourists. They have an outdoor patio in the front of the restaurant where people gather for beer and wine at all hours of the day in the summer. The patio gets tons of sunlight, which is a premium in Finland after the long, dark winters. Here is a not so crisp photo of a dinner salad I enjoyed at Virgin Oil Co. The menu has several large dinner salads, all of them have some serving of animal protein that can be left off. I found that it was easy to ask for adjustments on the food I ordered. This salad was served with reduced balsamic vinegar and pesto sauce. I did not ask, but I feel confident that they could put together a vegan or vegetarian veggie plate based on various side dishes on the menu. Luckily my parents were able to watch the kids during the trip because there was no way we could have afforded tickets for all of us on such last minute notice. On top of that, I think it would have been difficult to see as much as I did had I brought them along. I imagine they would have slept past noon and been up all night and I can't see them having much patience for walking around the big museums. If I had to rate the city on it's ease of eating a Vegan diet, I would give it a high rating. I think an 8 out of 10 is fair. There are plenty of outdoor and indoor markets that have produce and other vegan food products. There are several health food stores and at least one health food chain. There are many ethnic restaurants that have vegan and vegetarian offerings on their menu. There are at least two all vegan places to eat. Restaurants were all very accommodating when I asked up front for a vegan meal when there was clearly nothing on the menu. I was even surprised at one experience, where they didn't have a single vegan item on the menu and came up with a vegan dish made with tofu on the fly! Amazon has just lowered the prices on two of my favorite Vegan Cookbooks! If you can only get one, get this one! 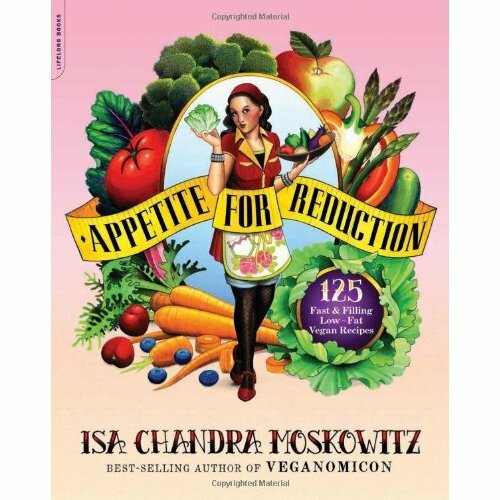 Appetite for Reduction is an amazing collection of low fat plant strong vegan recipes that you can wow your family and friends with. I use the recipes from this book along with Joel Fuhrman's "Eat for Health" in my cooking demos at the Florida School of Holistic Living. Recipes in Appetite for Reduction include Silky Chickpea Gravy, Ginger Mashed Sweet Potatoes and Apples, Chipotle Lentil Burger, 2nd Ave Vegetable Korma, Quinoa, White Bean & Kale Stew. Veganomnicon is another favorite cookbook, though I tend to alter the recipes more to make them low fat. It is still an innovative book of vegan recipes that you will want to have in your cookbook collection. Some of the recipes include Quinoa Salad with Black Beans and Mango, Miso Tahini Dressing, Chickpea Cutlets, Spicy Peanut and Eggplant Soup, Pumpkin Saag, Spaghetti and Beanballs.